The Mamata-Mayawati-Rahul-Akhilesh-Pawar-Gowda national mahagathbandhan is likely to fall short of a clear majority. The 2019 Lok Sabha election could prove the hardest to predict in decades. The Narendra Modi wave has subsided to a ripple. The anger against the Congress-led UPA’s decade of corruption has quietened. In the absence of the two waves that fed off each other in 2014 and lifted the BJP to an historic majority in the Lok Sabha, the 2019 general election will be the most open since 1996. For the BJP, a realistic strategy must accept the fact that 272 Lok Sabha seats in 2019 are out of reach, whatever party president Amit Shah may say publicly about winning 300 seats. The anger against the Congress-led UPA’s decade of corruption has quietened, but is that enough to change its fate? This analysis is not a projection, but a rational target for a party that has lost electoral momentum in key states like Uttar Pradesh, Rajasthan and Madhya Pradesh. Much will depend on Modi’s campaigning. He intends to address 50 rallies in the run-up to the four state elections later this year — but the real action will begin in January 2019. The Congress will attack the BJP on corruption and cronyism. 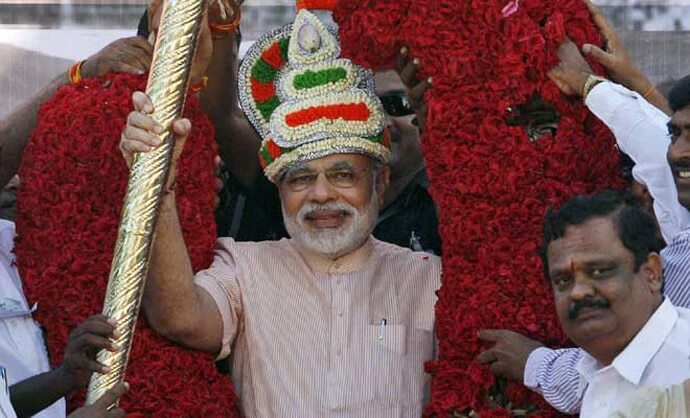 Modi will campaign on his five-year performance. The 2019 Lok Sabha election will be won or lost on a combustible mix of chemistry and math. 1) Maximum focus states: Uttar Pradesh, Bihar, Gujarat, Madhya Pradesh, Chhattisgarh, Rajasthan, Maharashtra and the Northeast. In these seven states and one Northeastern region, the BJP won 212 Lok Sabha seats in 2014 of the 284 seats on offer. In 2019, it can realistically hope to win at most 170 seats: UP (35/80), Bihar (20/40), Gujarat (23/26), Madhya Pradesh (20/29), Chhattisgarh (8/11), Rajasthan (18/25), Maharashtra (26/48) and the Northeast (20/25). The BJP will lose a big chunk in UP on account of the SP-BSP-Congress alliance, suffer erosion in Madhya Pradesh, Rajasthan, Gujarat and Chhattisgarh, and make up a bit of that in the Northeast. 2) High focus states: Jharkhand, West Bengal, Odisha, Haryana, Delhi, Himachal Pradesh, Karnataka and Uttarakhand. In these eight states, the BJP won 54 Lok Sabha seats in 2014 of the 131 seats on offer. In 2019, it can realistically target to win 45 seats: Jharkhand (7/14), West Bengal (6/42), Odisha (6/21), Haryana (6/10), Delhi (3/7), Himachal Pradesh (3/4), Karnataka (10/28) and Uttarakhand (4/5). BJP president Amit Shah hopes to win more seats in West Bengal and Odisha than projected here, but that may prove optimistic. In maximum focus states, the BJP could win 170 seats. In the high focus states it could win 45 seats. Total: 215. Now to the final group of targeted states. No longer the most formidable. 3) Medium focus states: Goa, Jammu & Kashmir, Sikkim, Punjab, Tamil Nadu, Andhra Pradesh, Telangana and the Union Territories. In these states and UTs, the BJP won 15 seats out of 109 on offer in 2014. What is it likely to manage in 2019? Goa (1/2), J&K (2/6), Sikkim (0/1) and UTs (4/6). That makes it seven seats in the two small states, Sikkim and six UTs (Lakshadweep, Puducherry, Chandigarh, Dadra & Nagar Haveli, Daman & Diu and Andaman & Nicobar). A sprinkling of seats from Punjab, Andhra, Telangana and Tamil Nadu could add another six seats to the BJP tally, taking it to 13 seats from the final group of targeted states. The grand total from the three focus groups: 228 Lok Sabha seats (170+45+13). Near election time, can Modi’s chemistry and Shah’s booth-level math increase that tally significantly? Improbable but not impossible. Now turn to crucial ally management. The BJP will need at least 44 seats from allies to wring a majority of 272 seats in the Lok Sabha. Significant ally potential lies in six key states: Bihar, Maharashtra, Telangana, Punjab, Andhra Pradesh and Tamil Nadu. In Bihar, the JD(U) and smaller BJP allies could contribute around 10 seats despite the RJD’s resurgence, giving the NDA 30 out of the state’s 40 seats. In Maharashtra, following last week’s civic body results in Jalgaon and Sangli where the BJP trounced the Shiv Sena, the Congress and the NCP, the Sena will contest separately from the BJP but, as it did in the December 2014 Assembly poll, join the NDA in a post-poll alliance, contributing around eight of Maharashtra’s 48 seats to the NDA pool. In Telangana, the Telangana Rashtra Samiti (TRS) could sweep the state with up to 14 of 17 seats but may well jump aboard the NDA bandwagon where federal bounties await it. In Punjab, the Akalis will remain anaemic but bring in around three of the state’s 13 seats. In Andhra, the YSR Congress again could contribute a handful of seats to the NDA if its rivalry with the Telugu Desam Party (TDP) is astutely leveraged by the BJP. Finally, in Tamil Nadu, an MK Stalin-led, post-Karunanidhi DMK should win the state in a possible alliance with Kamal Haasan. The BJP will have to extract whatever electoral crumbs the fatally wounded AIADMK (and a reluctant, fence-sitting Rajinikanth) can offer. Thus, the NDA ally count could look like this: JD(U) and smaller parties in Bihar: 10; Shiv Sena 8; TRS: 14; Akalis 3; YSR Congress 2; AIADMK 5. That adds up to 42, taking the putative NDA tally to 270 Lok Sabha seats (228 + 42) as a best estimate for 2019. Independents may need to be inveigled but a clear majority will elude the NDA. Will that stop Modi in his tracks? Will it give him a second term? Possibly. Will it make him a more collaborative, conciliatory Prime Minister? Probably. 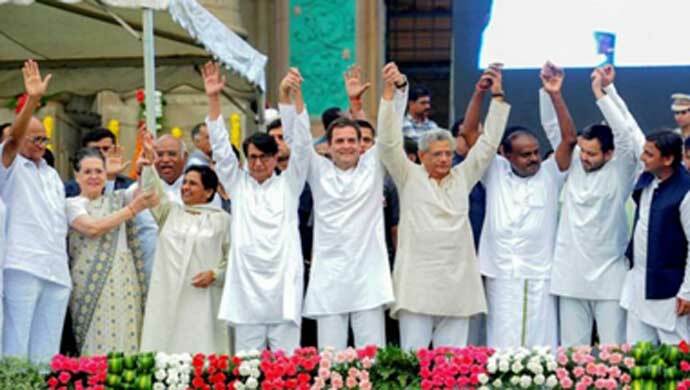 What about the Mamata-Mayawati-Rahul-Akhilesh-Pawar-Gowda national mahagathbandhan? It too is likely to fall short of a clear majority — and by more than the NDA’s handful of seats. Get ready then for a khichdi government — but one cooked in Modi’s, not Mamata’s, kitchen. Also read: Rajya Sabha deputy chairman polls: Time for Rahul Gandhi to hug his 2019 dreams goodbye?